Cadbury is giving away free Valentines chocolate hampers worth £10 each. 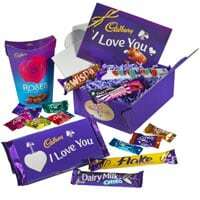 For a chance to win a hamper for yourself, just fill in the competition entry form on Cadbury Gifts Direct website. Click on “GET IT HERE” button and then follow instructions given above for a chance to win a free 1 of 10 of these hampers.